Since before I could walk, I have been on the hard water fishing with my father and grandfather and these days I have added friends and my two boys to that list, constantly searching for those elusive deep water trophies, that are harder to catch but give you 10 times the reward when you pull that lunker through the ice with frozen hands, using minimal gear, and that resonating thought that always goes through your mind when standing on the ice, am I in the right spot? 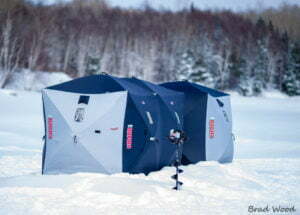 My love for ice fishing has never faded, the older I get the more I demand of myself to get out there and catch fish. There is one very prominent fact (I will call it a fact) that always seems to stand out, and that is the fishing isn’t getting any better. Now don’t get me wrong I understand the many factors in this, such as people and boat population increases on lakes, seasonal weather condition changes ( water levels, snow/ice conditions ), number of people traveling outside their local fisheries to fish new waters and I could go on, but there is one aspect in my opinion that I have noticed over and over again through my whole life ice fishing that I believe may have a huge factor in sustaining fish populations and that is what I am writing about today. Catch and release while ice fishing in deep water for trout and pickerel (the top two affected species in deep water in my opinion, so I will use these species as my conversation pieces) from what I have witnessed in my life could be devastating to a sustainable fish population, especially on a lake that is starting to see an increase in consistent fishing pressure. Over the years of fishing I cannot count high enough how many times I witnessed amateur fisherman ( and I will strongly lean this problem on men as I see women as cautious in the sport with less affect to this problem) reeling in and trying to land their catch at an exceptionally fast pace. Now I understand you can down rig in the summer at the same depths but when fishing from a boat in open water the fish has way more options and control on how it decides to fight you without being pulled straight up to the hole at an accelerated pace, with the result being at times the fish getting the bends and not being able to swim back down and even having its air bladder exposing its self out the fish’s mouth and killing it. The shame in this is that this fish was brought up way to fast as the angler was afraid of losing it, most likely due to lack of skill, the same lack of skill that didn’t allow the angler to recognize they have a fish on that wasn’t big enough to eat or would meet slot limit sizing of the particular lake. The issue of unskilled hard water anglers is growing due to the increased growth of the sport, which is absolutely a good thing for the sport and the Ontario economy, but again could be devastating on fisheries. Think about this for one second, I read an article regarding fishing on family day weekend on Lake Joseph, in Muskoka Ontario, in 2018 (can’t find the article to quote it, so I will reference estimated numbers, correct me if I am wrong) the MNR did a helicopter survey to count how many people came to fish and they got a number of like 8000 people, now I primarily fish Lake Joseph for trout and I can tell you on an average weekend of being out there you will see 400-800 people max, so this is a massive influx of people fishing due to the reduced licensing laws that weekend. Now think to yourself how many of these people are amateurs, as obviously they don’t normally poses a license so they don’t usually fish. So of these 8000 people, let’s say 7000 are not local, seasoned, fisherman (remember I already said an average weekend you see 400-800 max) now of these 7000 people let’s say that 3500 people catch a lake trout at over 60 feet of water that is too small to keep, if you have fished lake Joe, you know I could make that number much larger. Of those 3500 fish let’s say 1500 fish (again being very reasonable) are retrieved to fast and do not survive the release, that’s 1500 fish in one weekend dead, there are at least 10 weekends a year of solid fishing on lake Joe, if you factor in the less number of fisherman on non family day weekends, you are at an absolute minimum in my opinion of having a catch and release death rate on this lake of 2500 plus fish a season. You could use the same ideals as written above for any pickerel lake where you are fishing deeper than 30 feet. Pickerel or walleye whatever you prefer, have a hard time recovering when being retrieved from below 30 feet in cold water, and then you have to factor in slot sizes on pickerel lakes which make for another major factor within my concerns. To me that number is way too big, so how do we solve or correct this problem without shutting down a season and hurting a local industry. Now there are ways to prevent a fish from getting sick/hurt, but that goes back to experience and composure when ice fishing which comes with time/experience and to me seasoned fishermen are not the concern here. I would also like to point out if I make the mistake of retrieving a fish too quickly and it’s small and it shows signs of the bends I keep that fish as my daily total and don’t release it. I would also like to make the point that just because a fish swims away slowly, does not mean it survives. So how do we prevent the death of caught and released fish on the hard water? To me the answer is remove catch and release from ice fishing, make it so if the lake you are fishing on has a daily limit of two fish, then the first two fish caught are the fish you keep and you must cease fishing at that point. The biggest complainant I believe you will hear is “ Well then I have to take a fish home that’s smaller then I want and doesn’t have a lot of meat on it, and I don’t want to keep that fish”. My answer to that is find a different spot, use a different presentation i.e. use a larger presentation targeting larger fish. If every fisherman was held to this code think of the reduction in dead fish per season, you will still have some though. Now if you factor in the thought of, if you release one fish and it dies and you keep your bag limit of two, you have actually exceeded your legal daily take on that lake as you have actually removed/killed a total of 3 not 2 fish. Now think about with the number of fish deaths due to fishing dropping probably below a 100 per year and plus the fact that less breeder size and trophy fish will be removed how fast a lake could recover its population and then begin to sustain those increased numbers for the foreseeable future. I am absolutely writing this article from my point of view and with the mind set of wanting to hear feedback, opinions and rebuttals. I am by no means saying I have all the answers or have solved the problem, but I do believe that I am on the right track; with a possible solution to what I believe is a bigger problem than some people seem to understand. May the water be hard and your line be tight, good luck on the ice. 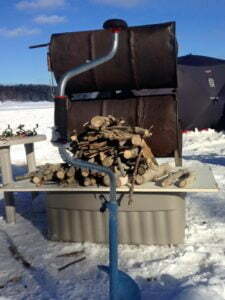 This entry was posted in Ice fishing.